At BitGuild, a lot of time has been spent finding games built on the Ethereum network. While there are a lot of games out there, a lot of them are not as interactive as traditional games. Some are idle or simply collectibles attempting to follow in the success of CryptoKitties. However, we’ve found that if you dig deep enough, you can find several games that are appealing to your more traditionally focused gamer. As gamers, we should be excited about games built on the blockchain. Blockchain games often give players the potential to make money, simply by… well… playing the game! This is because they can safely and securely trade items with each other without having to use a “black market”. As many gamers know, attempting to buy or sell items outside of the agreed upon confines of a traditional game can come with consequences from developers, or leave you high and dry because the person you thought was trustworthy ended up scamming you — leaving you with nothing! Let’s use Fortnite as an example. Fortnite is expected to make over a billion dollars this year. It’s mind-blowing considering it is a free-to-play game, and all in-game monetization is cosmetic. In Fortnite, if you have an incredibly rare emote, it’s technically owned by Epic Games. You could never use or sell the emote outside of Fortnite — and if you somehow did, Epic Games would probably bring down the ban hammer on your account. But imagine if you could, without resorting to black markets, sell the incredibly rare Rock Out emote. You’d probably turn a small profit and Epic would also make a cut of your sale. Blockchain gamers have exactly that ability. The ability to take items, cards, weapons, or whatever else they’ve obtained through gameplay, and sell them to other players. Let’s learn more about these games and see how it’s possible to make some money playing them without being an eSports star. Here are a few titles we believe should be on everyone’s radar. The design, creativity, and uniqueness of each of these games are just a few of the reasons we’re excited about them. Gods Unchained was one of the first games that wowed us. The artwork is incredibly intricate and beautiful. It also happens to be one of my favorite genres, a trading card game, with mechanics similar to Blizzard’s HearthStone. The Gods Unchained roadmap has Beta balancing occurring in Q4 of this year, with their first official tournament beginning in Q1 of next year. As of writing, the pool prize for the tournament is at $260,056. We were excited about Gods Unchained from the get-go. The gameplay and design seem great. Every card has been thoughtfully designed and powers crafted to play off the strength of the God associated with the card. Speaking of the Gods, each one has an awesome backstory! It’s hard to pick a favorite, but Ludia, the Goddess of Deception, is pretty awesome. The gameplay is straightforward, but knowing the right combinations and the cards that play well with the God or Goddess you’re battling with is where the fun begins. Every God has three regular powers and one Ultimate Power. Understanding your opponent’s God power should provide some insight into what kind of deck they’re running. Mana is consumed with each card played, and you gain one mana after each turn. Then it comes down to your strategy against theirs. Using Ludia as an example, a player may want to play sleep skill cards late against the opponent’s high mana card. Early in the game, maybe wanting to play hidden cards to build a quick board advantage. Then again, the strategy could be completely blown up, and the deck gets rekt. The Gods Unchained monetization model is simple, tried, and true — a system as old as the genre itself, dating back to physical card games such as Magic: The Gathering over 20 years ago. Players purchase card packs, and the marketplace is where they can trade unwanted cards with other players. The developers will make a small percentage on each of the transactions. However, this opens the door for players that purchased Gen0 card packs to sell their unique and verifiably limited cards to players finding their way to the game later down the road. Players can also make money entering tournaments. 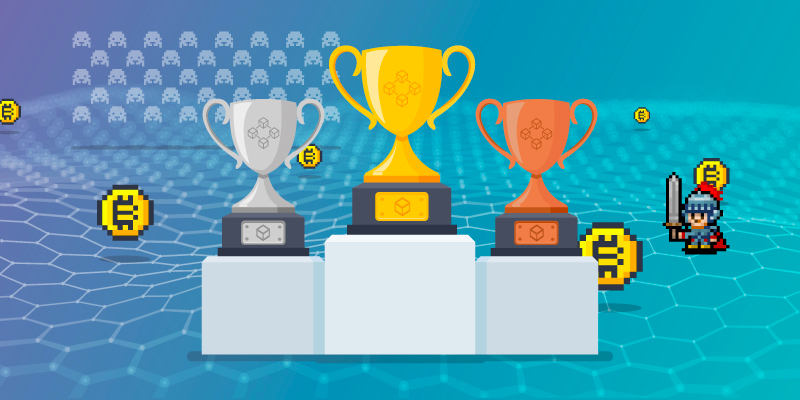 The first tournament may be the first eSport on the blockchain, with a growing and already large prize pool. So, as a gamer, you can make money buying and selling cards and playing in tournaments. There are twenty-four talented people behind Gods Unchained from developer Fuel Games. They’ve also developed Etherbots, another game built on the blockchain, and coming soon is Etherbots 2. As soon as we saw War Riders, the immediate thought goes back to our days of playing Twisted Metal. The nostalgia of having vehicles equipped with armor and firearms with only one objective (mass destruction!) was exhilarating. War Riders is an MMO set in a post-apocalyptic world where players mine for cryptocurrency and eradicate your enemies from the world. The only currency left in the world is Benzene, and that is what you’re fighting to gain. Benzene is used to trade and purchase certain items, as well as ETH. They are currently running their vehicle pre-sale, so now is the time to get into the game. The beta is scheduled to start by the end of 2018. What’s exciting about War Riders is the ability to purchase, trade, and customize your vehicle to look like no other. The vehicles are unique with each one having their own top speed, acceleration, Benzene tank, armor, and a certain number of attachable guns. Build your vehicle from scratch, trade for parts you want or need, and get back out into the apocalypse to collect as much Benzene as you can. The developers of War Riders are monetizing the game through their vehicle and weapon sales. As with every game built on the blockchain, players can buy and sell vehicles, parts, and weapons in the marketplace because after all, they’re yours. Ideally, you can also make some money by getting into the game early and collecting as much Benzene as possible while destroying your enemies and taking theirs too. War Riders has a team of twelve working on the game. The game is being developed by Cartified Inc., founded in 2015, a VC backed startup out of North America. If you see any of us out in the desert, you’d better drive the other way because we will come at you guns blazing, ready to take your Benzene, baby!. The Bitizens alpha is out now and is currently an avatar game. It will be developed into an open-world social RPG where players can create their own unique Bitizen, and select their wardrobe to really customize their character. Coming soon from Bitizens is the new mining feature, as well as the illustrious Bitropolis cityscape. Players will soon be able to search and mine for valuable items, while exploring the sprawling city in front of them: Bitropolis. It’s here that players will be able to gather and socialize with others around the globe. The possibilities are truly endless when you bring communities together in the blockchain. Players will be able to make money through the Bitizens marketplace as well as the expeditions you can send your avatar on. The expeditions are the mining feature which is scheduled to release at the end of the year. Expeditions will provide players an opportunity to see a return on their investments. In the future, players will be able to own nodes and benefit from players going on expeditions to the node they own. Bitizens is being developed right here, in-house at BitGuild. We have an incredible team of nineteen artists, engineers, designers, and product manager working day-in and day-out to create a fun, interesting, and amazing experience within Bitizens. There’s lots more to come regarding Bitizens, so keep your eyes and ears peeled so as not to miss out on anything. Now, this isn’t every great game coming to the Ethereum network, not by any means. There are some games we believe are going to be great, but they’re probably not going to be seeing the light of day for another few years. There are always new, up and coming games though, so stay tuned for the next list of games coming to the blockchain gaming space, such as CryptoDungeons, Blockchain Cuties, My Crypto Heroes, Hedgies, Rumble Legends, and Lordmancer II (just to name a few! ).